Hinoki is widely used as a construction material in Japan, along with sugi (Japanese cedar). Hinoki usually grows up to 20-30 meters high. Some hinoki trees grow as high as 50 meters. That such a huge tree can be cultivated in a small, narrow vessel is one of bonsai's enduring attractions. 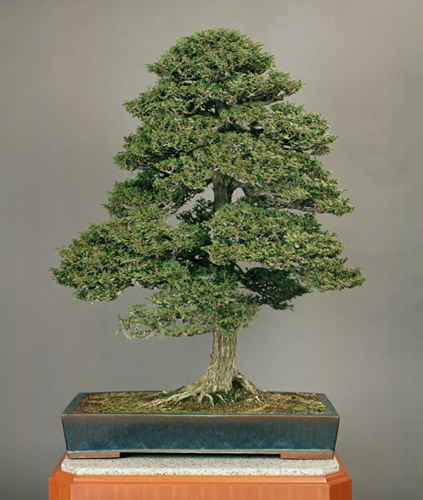 This bonsai work is well known for being displayed at various events, such as the 49th Kokufu Bonsai Exhibition. 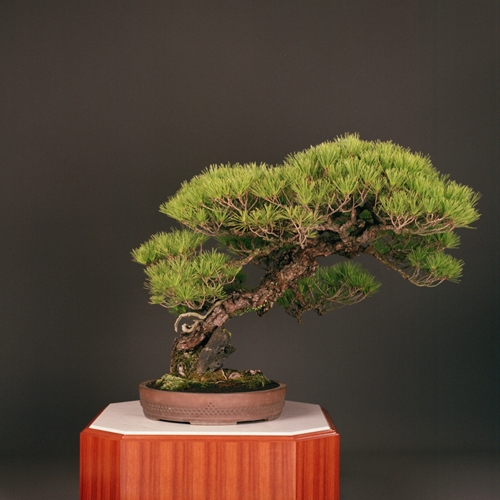 On such occasions, its elegant lines draw much attention from bonsai lovers. It represents the "moyogi" (informal, upright style), seen in the way its trunk reaches straight up from the powerful exposed roots and the fine "edajun" branch lineup. The tree, which is a century and a half old, seems to epitomize a forested landscape deep in the mountains, although it is a single tree. It has firm "hasho" leaf features which are peculiar to hinoki. Its trunk and branches have grown bigger, compared with about 30 years ago when it was fairly round in shape with each branch cut back. 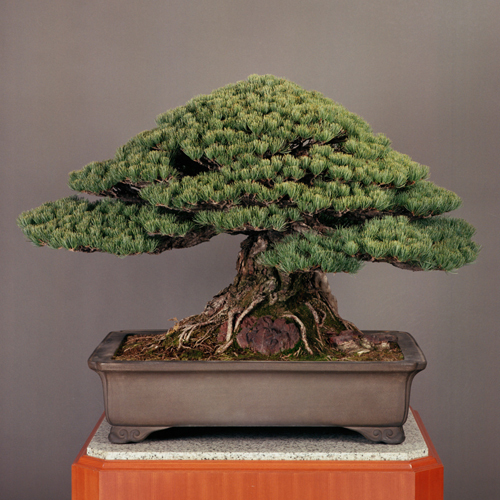 It has now grown up into a form signifying how a hinoki looks in nature. photo　Hinoki (Japanese cypress) in a rectangular "namako" (sea cucumber) pot. Red leaves bloom from the tree in April. The color is not as vivid as hues found in the leaves of "deshojo," another momiji species, but it is a cherished spring color. The tree features radial "nebari" (surface roots) and dynamic "tachiagari" (the initial rise of the trunk) that help balance the shape of the whole tree. 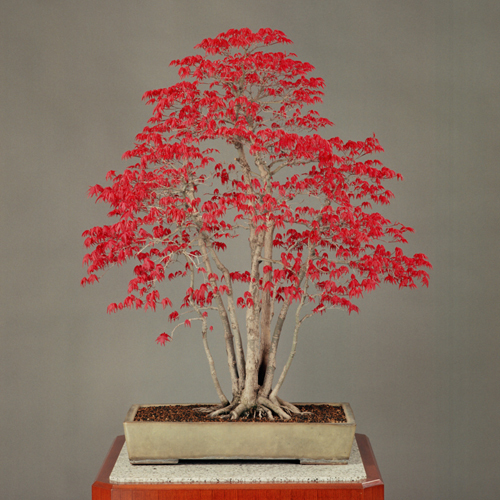 Its "mikihada" trunk surface gives a sense of old age and represents an ideal momiji bonsai work. Given that its leaves grow strongly in summer, the tree was planted in a relatively large vessel. This makes viewers think of a tree growing from Mother Earth. The momiji captivates bonsai lovers throughout the year with its changing colors -- fresh greens in early summer, dark greens in midsummer, the yellow of its fall foliage and its "kanju" (bare form) in winter. These charms are unique to deciduous trees, and denote for Japanese the "wabi-sabi" aesthetic. photo　Momiji (Seigen species of Japanese maple) in an oval ''shiro kochi'' white Cochin vessel. This tree is a masterpiece also called "tsuru-no-mai," or a dancing crane, after its elegant style. Planted in a small square pot, the tree suggests a long-legged crane with wings outstretched. It also recalls the "bunjingi" style favored by Meiji-era literati in which the number of branches is kept down. While giving it a feeling of lightness, the way this emphasizes the trunk's natural movement is outstanding. The leaves are treated to moderate "metsumi" (bud-trimming) and "hasukashi" (thinning out). It draws its charm from the somewhat twisted "mikimoyo" (trunk patterns) and a natural bulge at the "ichinoeda" (the first branch from the base of the tree). The tree, which is about 100 years old, is one of the younger among the bonsai trees at the Imperial Palace and it has good "jusei" (vigor). As time goes by, the tree is expected to grow into an increasingly impressive kuromatsu. 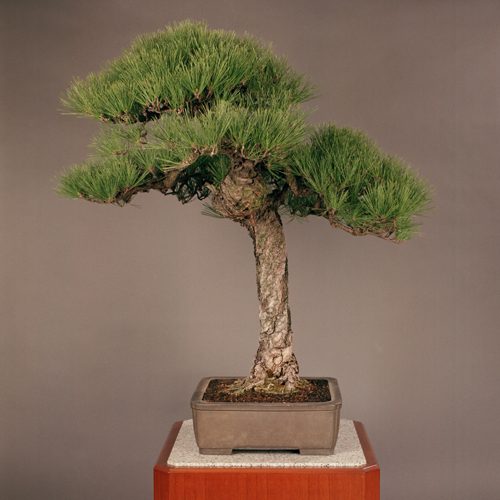 photo　Kuromatsu (Japanese black pine) in a "seiho" square pot with each corner indented. The container is made in Tokoname, Aichi Prefecture. Tosho, an evergreen tree of the cypress family, is also called "nezu" or "nezumisashi." There are a variety of tosho species, such as "moroda" and "modora," in parts of Kagawa Prefecture. They differ in "hasho" leaf features but belong to the same family. The tree's leaves are hard and sharp like needles. Tosho develops complex "mikimoyo" trunk patterns as it grows. Much of the trunk exhibits the deadwood feature known as "shari," in which the trunk has no bark. The tree is distinguished by the tiny remaining portion of the trunk that is still alive, with its wild appearance stemming from interwoven "jin" branches that all look like they have been stripped of their bark. Tosho trees are seen in various parts of Japan. In cold areas, snows and strong winds help Tosho trees take exquisite forms. In this bonsai tree, believed to be a product of the Higashi-Mino area in Gifu Prefecture, central Japan, importance is attached to its natural form, which exudes the dignity of a mighty tree. It was put on display at the 75th Kokufu Bonsai Exhibition, where it was highly praised for surviving over two centuries in a relatively small vessel. photo　Tosho (needle juniper in an oval "shidei" unglazed purple pot. The tree looks as if is perched on seaside cliff in a strong wind. It has a typical "shakan" slanted trunk and the pattern of branches gives it an airy look resembling the "bunjingi" (literati) style favored in the Meiji era. The trunk is slender, but the bark is old and the deadwood "jin" branches lower down the trunk reveal the tree to be 130 years old. It has soft "hasho" leaf features that are peculiar to akamatsu. Some of its branches began to die out in the past, but the tree is now in good overall condition thanks to devoted care. A small rock has been placed at the foot of the tree to great effect. The rock has been assimilated into the tree, perfectly embraced by the trunk and roots. When the tree is transplanted, the rock is transplanted along with it. 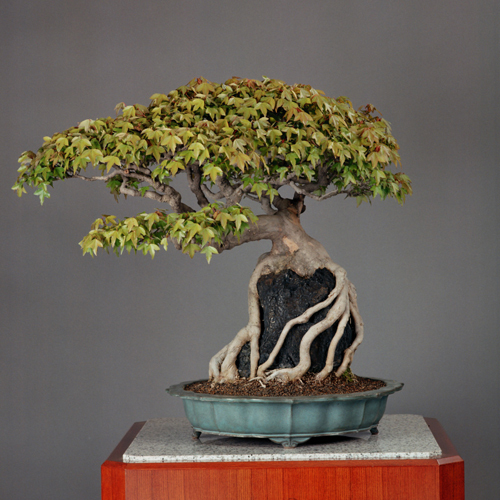 The tree, put on display at the 65th and 74th Kokufu Bonsai Exhibition, is well known among bonsai lovers as one of the bonsai trees of the Imperial Palace. Among "zoki" deciduous trees, "momiji" (Japanese maple) and "kaede" (maple) are particular favorites of bonsai lovers because of the way they show off the four seasons. Aficionados appreciate the young buds in early spring, the fresh green leaves in May, the red foliage in autumn, and the bare trunk and branches in winter. Kaede does not turn as red in fall as momiji does, but its autumn leaves -- a mixture of yellow and red hues -- are equally prized. At the Imperial Palace, this kaede tree has been transplanted almost every year according to the condition of its roots. Due to its beautiful appearance, it is used for ornamental purposes throughout the year. The tree attracts viewers drawn to the exquisite balance between its exposed roots and the rock on which it is planted. The foliage is dense on the left side but has a natural look, and the color and shape of its leaves are in good order. The tree seems to bespeak the sophisticated sense of the original grower. It is about 450 years old. The tree age is astonishing. Despite the great age, this tree continues to bloom flowers powerfully every year without showing any signs of weakening. The viewing season falls in late April. But this year, the Fuji tree sent out flowers a bit earlier than usual. The Fuji was in full bloom in mid-April with its long bunches hanging down. After the flower season is over, what appears to be a dent which looks like a hole comes to be seen in the lower part of its trunk. But it is not a hollow hole, but a work of natural formation that has grown into something like a dent over a long period of time. Despite the large size of the tree, it is planted in a relatively small pot. The vessel is overcrowded with tree roots. So, the Fuji tree is transplanted once in every two years with the roots being unstiffened. This is considered to be a species of the original Fuji, or the so-called yamafuji (silky wisteria), that had not been modified. 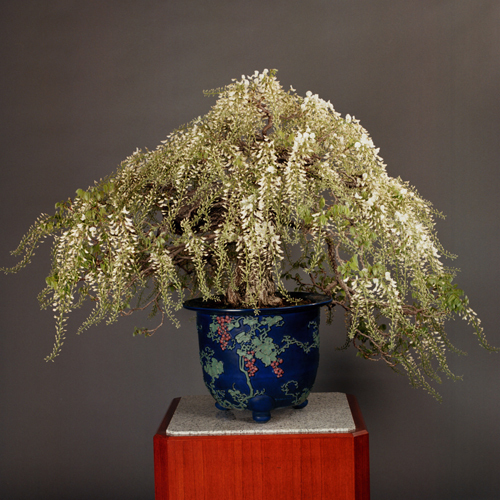 photo Fuji (Japanese Wisteria) in an Owari lapis lazuli round pot. Owari is the old name of the western half of current Aichi Prefecture. This is a large-sized bonsai tree that measures more than 1 meter in height. The dignified tree form brews a sense of large tree. Notably magnificent is the tree surface of the tachiagari lower part of the trunk that is peculiar to ganseki matsu (pine) trees. Also fine is the ochieda branch that hangs down vertically. Wires are not so frequently used at the Imperial Palace. It appears certain to have taken much time for the branch to hang down so straight. It is easy to imagine how extraordinary efforts have been made to maintain the hard feature of the trunk that curves from the root powerfully. This is a popular bonsai tree often showcased at various exhibitions.It was put on display at the 55th Kokufu Bonsai Exhibition, the 2004 Pacific Flora at Lake Hamana in Shizuoka Prefecture, and 11th and 20th Bonsai Exhibitions. It is well known among bonsai lovers. photo ''Gansekimatsu'' kuromatsu (Japanese Black Pine) in a bowl-shaped ellipsoidal container with double lines, made in Tokoname, Aichi Prefecture. This tree has a trunk surface that resembles that of an akamatsu (Japanese Red Pine). But as its hasho leaf features are so hard, this is aikuromatsu, a variety of kuromatsu (Japanese Black Pine). Grown with moderate fertilizers for a period of more than two centuries, it has a rich antique sense in an ellipsoidal vessel made in Tokoname, Aichi Prefecture, in central Japan. The whole form of the tree is well-balanced thanks to a house made of kuzuyaishi stone at its foot. Kuzuyaishi stone is often used to make an artistic azumaya small house or a rural hut. The aged solitary house accentuates the large size of the pine tree and also builds up a grand landscape. The natural foliage that covers the whole house is nothing short of brilliant. The tree shows the sense of the traditional Japanese aesthetics of wabi and sabi loved by tea masters. It was put on display in the 1970 World Expo in Suita, Osaka Prefecture, the 68th Kokufu Bonsai Exhibition and bonsai exhibitions at the Imperial Palace. photo Aikuromatsu tree in an ellipsoidal container made in Tokohame, Aichi Prefecture. Bright reddish leaves cover a ''De-Shojo'' momiji tree in the budding season in April, as shown in a photo. Most of those leaves turn green in summer, but some remain red. They turn red again in autumn before the tree loses leaves toward winter. The name of ''De-Shojo'' comes from the human-like imaginary animal ''Shojo'' which is said to be fond of alcohol. The word Shojo sometimes refers to a heavy drinker or something red. The tree is called ''De-Shojo'' as it is red when its buds come out (me-ga-deru). It is quite an exquisite naming. The tree form of the nine-trunk ''De-Shojo'' is well-balanced. Also superb is the combination with an old-fashioned ''shiro-kochi'' (white Cochin ware) container. The tree figure is particularly beautiful as it is repotted. The colorful tree, which measures nearly 1 meter high, could attract bonsai lovers in the spring budding, early-summer greenery and autumnal foliage seasons. Its wonderful trunk curve lines suggest how dignified it would appear after being defoliated. photo ''De-Shojo'' momiji (Japanese Maple) potted in a rectangular ''shiro-kochi'' (white Cochin ware) vessel. There are a large number of bonsai works. But only a few have titles. This goyomatsu bonsai has the title of ''Kimigayo,'' or Japan's national anthem unofficially translated ''His Majesty's Reign.'' It is not clear why such a title was given to it. 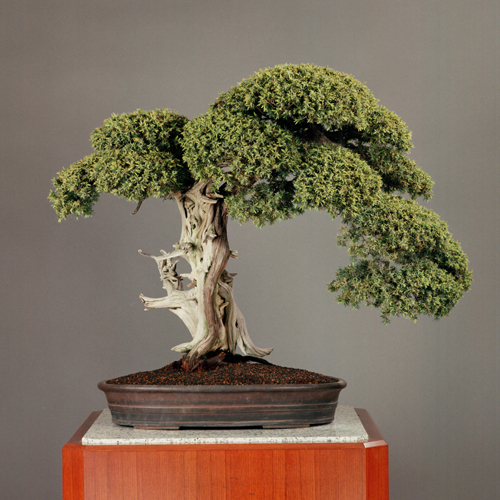 The masterpiece was put on display twice at the first and 30th Japan Bonsai Exhibitions. 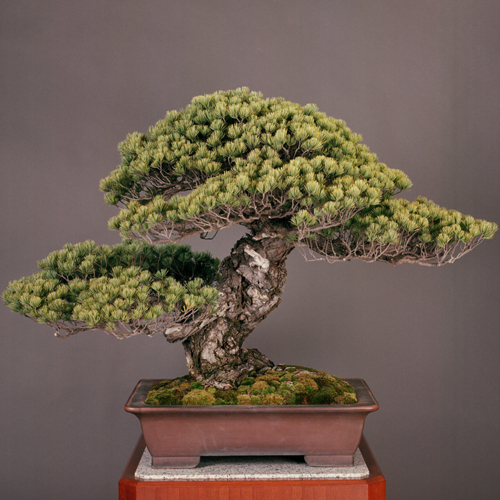 Its elegant figure has also been shown at bonsai exhibitions held at the Imperial Palace on various celebratory occasions. It was also put in this year's 83rd Kokufu Bonsai Exhibition as a special exhibit and many bonsai lovers were awed by it. This goyomatsu tree continues growing powerfully. With its height growing by 10 centimeters in the past 30 years, it has gained more vigor. Its rock-bearing trunk has become thicker while the volume of its leaves has increased. After being transplanted from a round pot to a square one, the tree has come to create the flavor of a completely different tree. Its wonderful leaf features and beautiful tree form may come from its original nature as Miyajima goyomatsu, one of the goyomatsu species. photo A bonsai masterpiece titled ''Kimigayo'' after Japan's national anthem. 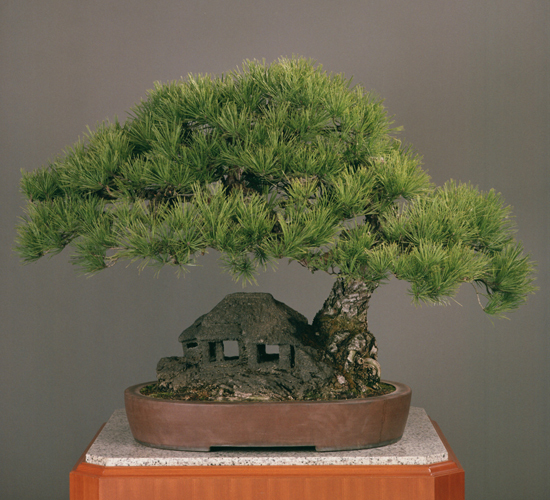 The 66-centimeter-tall Japanese white pine is planted on a rock and in a rectangular pot made in Tokoname, Aichi Prefecture. The Imperial Palace has a site for bonsai works called the Omichi Teien Garden. 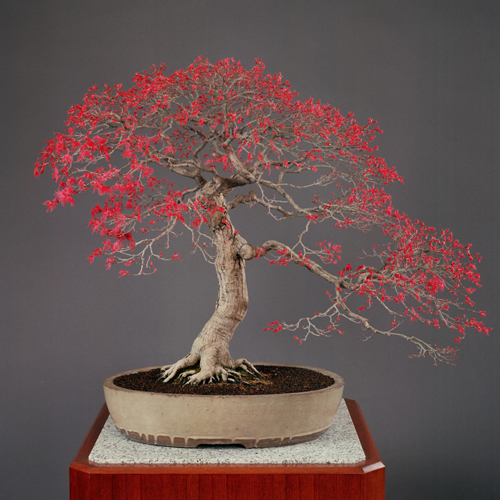 About 600 bonsai pieces representing some 90 species of plants are cultivated there. Among them are many hundreds-of-year-old trees. Bonsai at the Imperial Palace is characterized by three major features -- many large bonsai works, nature-oriented bonsai formations that hold down artificial techniques as much as possible, and a number of antique trees aged more than 100. They are believed to have added overwhelming elegance to bonsai works at the palace that are different from modern bonsai works. Many bonsai lovers long to see bonsai pieces at the palace. Outstanding among them is a goyomatsu (Japanese white pine) bonsai, titled ''Third Shogun,'' which is called the masterpiece of masterpieces. It is a historic item which is believed to have been treasured by Tokugawa Iemitsu (1604-1651), the third shogun (tycoon) of the Tokugawa shogunate government. Its stable form, powerful trunks and good balance with the container carry a sense of history and nature. It is a large bonsai. There are no rivals for the ancient-looking tree. 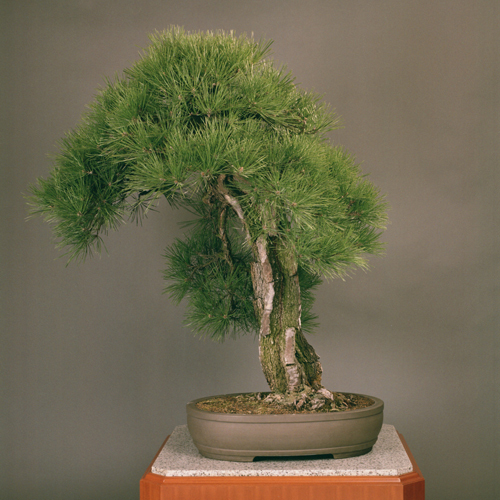 photo A Japanese white pine bonsai work titled ''Third Shogun,'' estimated to be about 550 years old. Measuring about 81 centimeters in height, it is planted in a ''shudei'' unglazed pot.